To help pass the long wait until Red Dead Redemption 2 finally arrives, EGM has combed through official announcements, leaks, and the best guesswork of the community to piece together a fuller picture of the game. We’ve sorted out fact from fiction from theory to create your exhaustive guide to one of 2018’s most anticipated games. Where does Red Dead Redemption 2 take place? 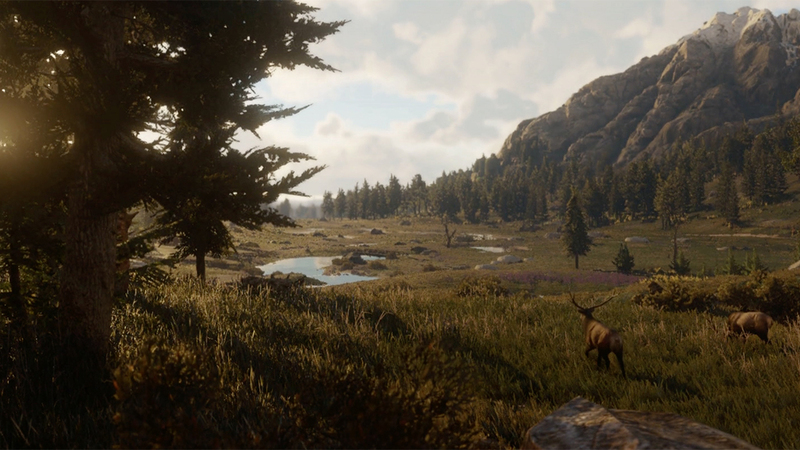 The official word from Rockstar is that the game is set in “America’s unforgiving heartland.” That last word generally refers to the American Midwest, and the trailer certainly shows plenty of vistas that meet those criteria. We also see more mountainous regions and swamps. We’re definitely dealing with a different region, at least in part, than we saw in the first game, which spanned the Far West and Mexico. For more specific info, you’ll want to read on to the “What we think we know” section below, as there’s good reason to believe we already know a whole lot more about the game’s setting. Does Red Dead Redemption 2 have multiplayer? Rockstar has confirmed that the game will have a “brand new online multiplayer experience.” Think GTA Online, the separate multiplayer mode included with Grand Theft Auto V, but built around the gameplay and map of Red Dead Redemption 2 instead. Despite the likely similarities, the CEO of Take-Two Interactive, Rockstar’s parent company, said he doesn’t expect Red Dead Redemption 2‘s multiplayer to compete directly with GTA Online. Take that to mean what you will. What is Red Dead Redemption 2‘s story about? Is Red Dead Redemption 2 exclusive? Not really, but sort of. While the game itself will be arriving on (at least) Xbox One and PlayStation 4, Rockstar and Sony have announced a special partnership to bring certain content to the PlayStation 4 first as a timed exclusive. What platforms is Red Dead Redemption 2 launching on? At the moment, Rockstar has only confirmed Red Dead Redemption 2 for the PlayStation 4 and Xbox One. The publisher has a long history of later releasing its biggest games on new platforms, however, so the list could well expand in the future. When is Red Dead Redemption 2‘s release date? The game was initially announced for release in the fall of 2017, but Rockstar dashed our hopes of playing the game this year when it revealed the game had been delayed into spring 2018 back in May. According to a follow-up from Rockstar parent company Take-Two Interactive, the game will be out during its 2019 fiscal year, which doesn’t kick off until April 1st, 2018. That means we’ll see the game in April, May, or early June 2018—assuming there’s not another delay. We might not be so lucky, given Take-Two’s CEO, Strauss Zelnick, has insisted Red Dead Redemption 2 will be successful no matter when it launches, specifically citing the fact that summer releases can still do well. He also said the main goal of the delay is to ensure the game is the best it can be, so that’s nothing to be upset about. Where can I watch the Red Dead Redemption 2 trailer? You’ll find the game’s reveal trailer just below. You should really watch it immediately if you’ve somehow missed out until now. It’s that good. What does Red Dead Redemption 2‘s map look like? A leak that predates the game’s official announcement allegedly showed the complete map in blurry form. It’s impossible to confirm whether the leaked map is genuine, but it dovetails with everything we’ve seen so far. A great deal more of the map is also dedicated to water in the forms of lakes and rivers, with several large islands marked as places of interest. This could mean big changes to the gameplay, as we cover in greater detail below. Is Red Dead Redemption 2 a prequel or a sequel? Most signs point to a prequel, despite the fact that there’s a “2” in the name. For starters, the first Red Dead Redemption was about the decline of the Old West, with civilization rapidly encroaching on the frontier lifestyle. That would leave little room for a story set in a later year—not to mention the fact that the game’s ending was, well, pretty conclusive. Perhaps the earliest evidence for the prequel theory is the same leak that brought us the map. The leaker alleged that the story would take place just before the events of Red Dead Redemption and be set just to the east of that game’s map. Nothing official we’ve seen so far has disproven any of the leaked information, so it’s safe to assume the game is a prequel until further notice. What’s more, later sleuthing from the fan community resulted in a sprawling theory involving actors from the first game connecting up on social media, among many other things. It’s a complicated bunch of circumstantial evidence, but the basic gist is the game is likely a prequel focused on John Marston’s earlier days. It’s worth noting, however, that only a single voice actor has actually been confirmed for the game so far, and he’s said he’s not even part of the main cast. Is John Marston in Red Dead Redemption 2? If we’re operating on the principle that the game is at least partially a prequel, it’s likely that John Marston will return. Fans have speculated that the posse of seven riders seen in the game’s first artwork and trailer (as well as in the screencap at the top of this post) is actually Dutch’s gang. The community has compared the silhouettes to members of the gang that were in the first game, and the results are compelling. We’d say you can expect to play as a younger John Marston—though there’s a chance you’ll control someone else, and Marston will simply be a character in the story. What else do we know about Red Dead Redemption 2‘s story? Not a ton, at the moment, but fans discovered a movie homage in the trailer that may offer a clue. A shot in the trailer is a clear reference to Kevin Costner’s 2003 movie, Open Range, which followed a cattleman struggling to escape his past as a killer who’s drawn into violence by a corrupt lawman. That’s actually not too far from John Marston’s story in the original game, which may be telling—or it may be a sign that the reference is purely visual. Will Red Dead Redemption 2 have boats and/or swimming? 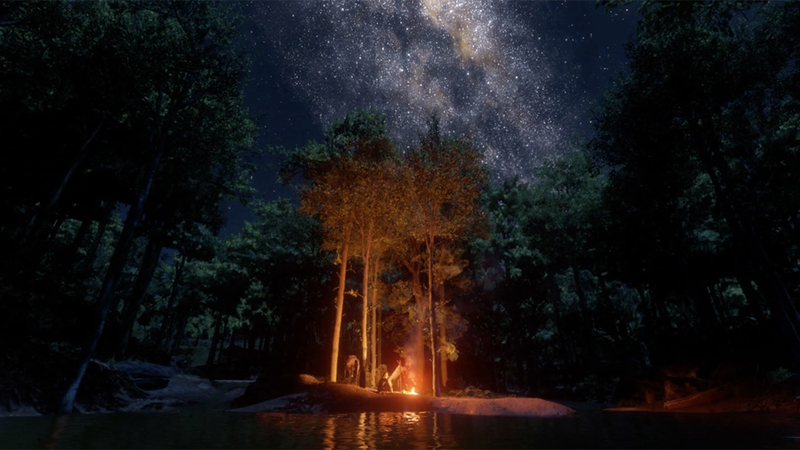 Between the leaked map showing plenty of rivers and islands and the shot in the trailer of two men in a canoe, it’s all but certain you won’t be bounded in by the water the way you were in Red Dead Redemption. Swimming is perhaps the less certain of the two, but it’s difficult to imagine Rockstar would let us travel by boat without a way to get safely to shore—or to swim out and hijack boats that are already on the water. Is hunting back in Red Dead Redemption 2? This one is almost certainly a yes. The trailer featured plenty of shots of wildlife, and one scene showed a man with a dead deer loaded up onto the back of his horse. 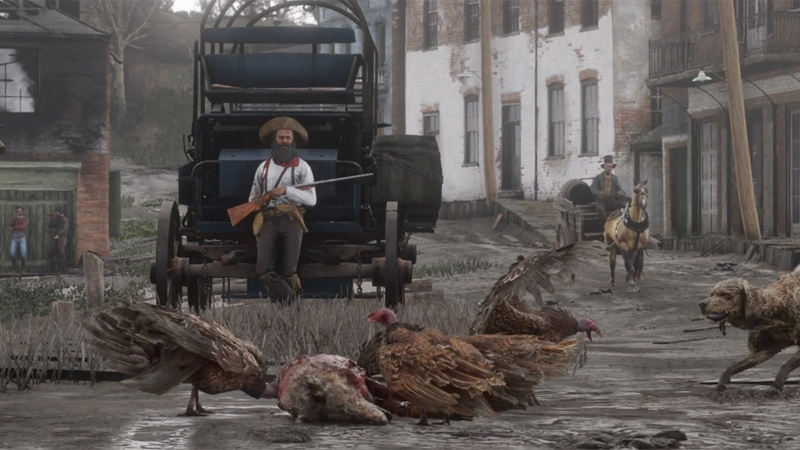 Hunting was one of the best things about the first Red Dead Redemption, so Rockstar would have to be crazy not to include it. What other gameplay elements are returning in Red Dead Redemption 2? Though Rockstar has yet to confirm anything concrete about gameplay, the trailer pointed to some obvious inclusions. We spotted trains, wagons, campfires, stores, and horseback riding, all of which will probably function recognizably to the first game. We also saw a man saddling up to ride out into a field of cattle, so the herding missions of the first game may make a return, too. Will Red Dead Redemption 2 support Project Scorpio? A report from April 3rd claimed that Red Dead Redemption 2 would be one of the games shown during the reveal for Microsoft’s upcoming Xbox One hardware upgrade, codenamed Project Scorpio. While the game didn’t show up during the reveal of the system’s final hardware specs, there’s every chance that claim will be proven true by the E3 showing. Given the sheer power of Scorpio, that could make the new Xbox One the best platform on which to play Red Dead Redemption 2. If Rockstar is indeed supporting the system and following Microsoft’s lead, that means we could see the game at 4K resolution and 60 frames per second. Then again, we already know for sure that Rockstar has a promotional deal in place with Sony for PlayStation 4–exclusive content, and it’s unclear if that could get in the way of any Scorpio support. Who is Red Dead Redemption 2‘s composer? Though it’s hardly confirmed, one clever fan noticed that the music in the reveal trailer sounds strikingly similar to a song composed by Gustavo Santaolalla for the 2004 film The Motorcycle Diaries. Santaolalla worked on The Last of Us and will be back for its upcoming sequel, so it’s possible he’ll be handling the soundtrack for Red Dead Redemption 2, as well. What is Red Dead Redemption 2‘s exact release date? We had a lot of retailer leaks leading us to believe that the big day would be October 3rd, but that’s been scrapped completely now that the game has been delayed. As mentioned above, all we know for certain now is that it won’t be arriving until April 2018 at the earliest—and that’s not enough. We need a date so we can count down the hours! How is Red Dead Redemption 2 connected to the first game? Even if we assume Red Dead Redemption 2 is a prequel, there’s no guarantee that it will fall into the standard prequel trappings. Judging by the Grand Theft Auto series, Rockstar tends to favor looser connections between its games than most developers. Will Red Dead Redemption 2 allow us to swap characters like in GTA V? One of the most interesting additions to Grand Theft Auto V was the trio of protagonists and the ability to switch between them throughout the story. Rockstar bet big on the concept, and it would be fascinating to see it return here, especially if Dutch’s gang is at the heart of the game. That’s a built-in set of heroes (or antiheroes) to explore. How much will Red Dead Redemption 2‘s online mode resemble GTA Online? We know just about nothing about Red Dead Online—including whether it will even be called that—but there’s somewhat obvious template in Grand Theft Auto V‘s standalone multiplayer mode. In fact, GTA Online was, in some respects, an extension of the multiplayer included in the first Red Dead Redemption. We can’t way to see where Rockstar will take the concept next. Will Red Dead Online have heists? We’re tempted to put this one in the “What we think we know” section, just because heists seem like such an obvious choice. They’re one of the best additions to GTA Online, and the Red Dead series is chock full of bank-robbing outlaws. It’s a natural fit, to be sure, but in the absence of any firm information from Rockstar, we’re left hoping the studio takes the clear path ahead of it to give us something truly awesome to do online. What is the PlayStation 4–exclusive Red Dead Redemption 2 content? We know that the timed-exclusive content will be limited to the game’s online mode, but there’s a wide range of options under that umbrella. If really cool features, weapons, or missions are locked away on one platform, that’ll be a strong incentive to pick PS4 over Xbox One. If the exclusives are limited to cosmetic upgrades, it might not be as big of a factor in which version to pick, especially if the rumors of Project Scorpio support we discussed above ultimately prove true. At the moment, Rockstar hasn’t announced any plans to bring Red Dead Redemption 2 to PC. That being said, Grand Theft Auto V and L.A. Noire were both initially billed as console exclusives, and both came out on PC—albeit at a later date. It’s far from impossible that RDR 2 will take the same approach, and Wedbush Securities analyst Michael Pachter thinks it will happen. Fans have even started a petition to make it happen. Will Red Dead Redemption 2 come to the Nintendo Switch? Nintendo’s next console is now on sale, and there’s still been no word on whether Red Dead Redemption 2 will come to the system. Rockstar has a spotty history of supporting Nintendo consoles, however, and at least one analyst predicts Red Dead Redemption 2 will be skipping the Switch. How will Red Dead Redemption 2‘s gameplay be different? Rockstar loves to up the ante in its sequels, which is part of the reason why the years-long wait between them always feels worth it in the end. We can’t wait to see how it’s improved the fundamentals and expanded the range of things you can do in the game. We’ve even put together our own wishlist of changes we hope they make. What will Red Dead Redemption 2‘s side missions look like? While the main story is the naturally the source of most of our questions, it’s the side content that really helps to flesh out any open world, and we want to hear more from Rockstar about how it’s going to be handled in Red Dead Redemption 2. The first game offered an interesting blend of full side missions, diversionary content, and random encounters that led to smaller side stories. It’s that last category that has the most room for growth, especially after Grand Theft Auto V expanded the concept to be more gameplay oriented. Will Red Dead Redemption 2 support cross-platform multiplayer? One of the most recent rumors surrounding the game claims that Rockstar is exploring the idea of allowing players on Xbox One and PlayStation 4 to play together as part of a unified online community. While the report is thinly sourced enough that we should probably be a little skeptical of its authenticity, even if it’s 100 percent true, we still don’t know for sure that the studio will actually be able to follow through. Multiple games have spoken publicly about a willingness and ability to switch on cross-platform multiplayer, but in every instance Sony has refused to allow it. If any game is big enough to convince Sony to gave, it’s Red Dead Redemption 2—but it’s still a very big if. Will Red Dead Redemption 2 get DLC? With Red Dead Redemption: Undead Nightmare, Rockstar crafted one of the most interesting post-launch add-ons for any game of the last generation, taking the core mechanics and world of the game and telling a new side-story full of supernatural hijinks. It’d be great to see Red Dead Redemption 2 get a similar expansion, though the absence of any single-player DLC for Grand Theft Auto V more than three months after launch may signal that Rockstar is moving away from the concept in favor of updates to its online modes. We’ll have to wait and see. Who will Rockstar tap for Red Dead Redemption 2‘s original music? One of the most memorable moments in Red Dead Redemption was riding into Mexico to the sound of “Far Away” by José González, a song written expressly for the game. We also learned that the band Animal Collective wrote a second original song that was never used. If Rockstar keeps up tradition, it’ll team up with modern artists to write something new Red Dead Redemption 2. We can’t wait to find out who it is. Will Red Dead Redemption 2 (or Red Dead Online) have a ton of microtransactions? Strauss Zelnick, the CEO of Rockstar parent company Take-Two Interactive, recently told investors that he thinks the company can do more with microtransactions in its games. Specifically, he said the company “can do more without interfering with [its] strategy of being the most creative and [its] ethical approach.” Now, your perception of the “ethical approach” of GTA Online‘s microtransactions may vary, but there certainly are a lot of things to buy that cost a lot of in-game money, and a lot of temptation to buy more in-game money with your actual real-world money. We’re hoping Red Dead Redemption 2‘s online component offers less, not more, in the way of microtransactions—but that doesn’t sound like it’s in the cards.